THEMUSEUM and The Walper Hotel have teamed up once again to bring the Second Annual #UnWeddingShow to downtown Kitchener! This exciting event will provide brides and grooms with unique options to make their day as special as can be. This year, we worked with the gorgeous Kate Moore for the UnWedding Show Photoshoot. 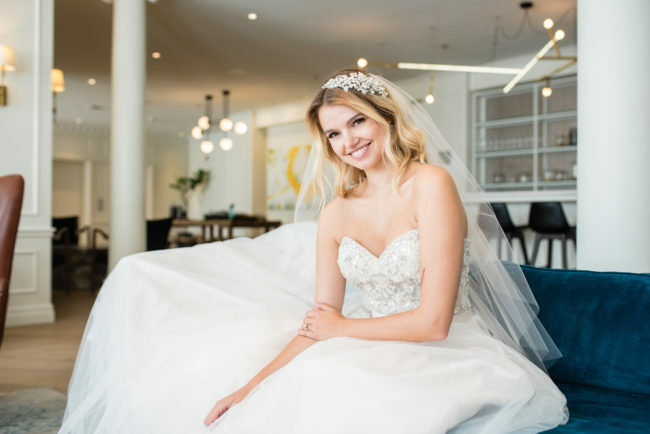 Valentina Bridal, located in Waterloo, generously lent us one of their stunning dresses – a two-piece corset and skirt – that fit Kate like a glove! With the sun shining bright and DTK bustling, we couldn’t have asked for a more perfect day! We began in Goudie’s Lane with a tasty donut wall – compliments of Taylor DeValk of The Walper – topped off with a stunning floral accent from Living Fresh Flower Studio. You can even catch our team sampling those tasty donuts compliments of The Walper Hotel. Thanks to Brent Wettlaufer for his talent behind the camera capturing some amazing moments. Check out these behind the scenes photos with many more to come. Just as excited about the #UnWeddingShow as we are? Join us Sunday September 10th, 2017 from 11:00 AM to 3:00 PM at THEMUSEUM for a fun-filled Sunday afternoon with some amazing and unique vendors.